Everything you need to know about starting the Whole30 Challenge. 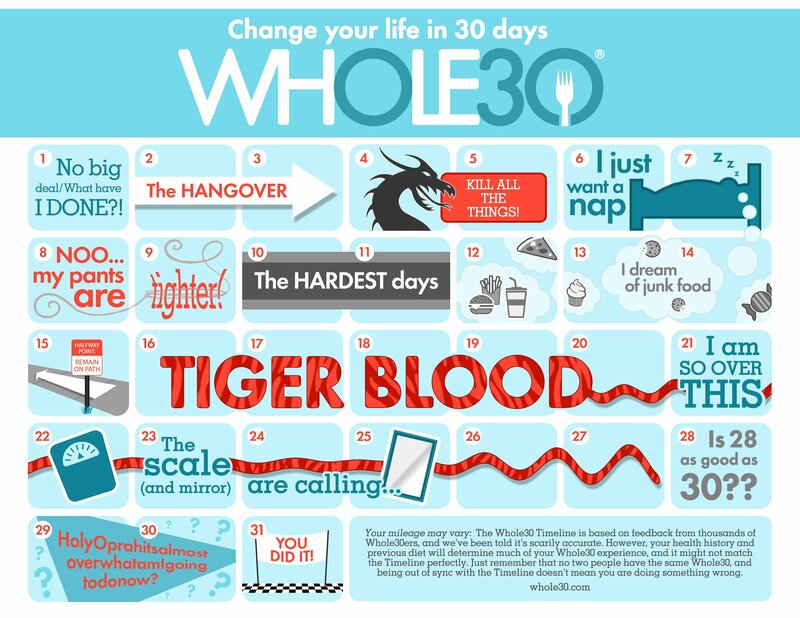 What is the Whole30 Challenge? Is there a Whole30 Foods List? Will I lose weight on the Whole30? What are the Whole30 Pros and Cons? What should I put on my Whole30 Shopping List? What should I expect when I do the Whole30? Do you have any Whole30 Results? Are there any good Whole30 Books to help me through? What about the Whole30 Reintroduction? Do you have any delicious Whole30 Recipes? Do you often find yourself tired or just not feeling right? It’s possible that it may have something to do with the food you eat. The Whole30 Program takes the top foods that cause cravings, inflammation and gut-damage right out of your diet. For 30 days. It can seem like a long time, but your body needs 30 days without these top foods to heal and start working like it should. After the 30 days are over, you reintroduce those foods one at a time until you find one that your body doesn’t agree with. But during those 30 days? You’ll feel better. I guarantee it. The Whole30 Challenge is life changing. By then end you’ll have happy & healthy relationship with food. When you are on the Whole30, the foods you’ll have to say no to are sugar (in any form…and yes, artificial sugar too! 30 days without sugar is not easy. ), dairy, grains, alcohol, and legumes. You’ll want to check labels for MSG, nitrites and carrageenan and stay far away from those. And lastly, it’s possible to make pancakes, ice cream and baked goods with “approved ingredients”, but the Whole30 program asks you not to. You’re trying to break cravings. So if you’re craving pancakes and you satisfy that craving with a Whole30 pancake recipe, two things will happen. 1. The pancakes will not be as good as fluffy, gluten-filled buttermilk pancakes. And 2. When you are off the Whole30, you’ll go right back to your own pancake recipe and ditch the “healthified” version. The idea behind saying NO! to those “healthy” comfort foods is to change your mindset during those 30 days. You don’t need those foods. Wondering about your favorite food? Find comprehensive lists from the authors of this program here. One of the rules of the Whole30 challenge is that you are not allowed to weigh yourself during those 30 days. In fact, I’d recommend throwing your scale away. If you read our results, you’ll find that during my second Whole30 diet, I felt amazing, but lost not one ounce of weight. That’s frustrating and all of my good feelings flew right out the window. Yes, you may lose weight, but that’s not the point. The point is to find foods that may be damaging your body that you don’t know about and to establish a healthy relationship with food, maybe for the first time ever in your life. In my opinion, the pros of the Whole30 challenge program is that you don’t have to count calories. I always fail at that. It’s freeing to be able to eat the approved foods without figuring calorie counts. Also, your eyes will be opened to what you are putting in your body. I couldn’t believe how many of the normal foods I ate for lunches and dinner that I thought were healthy had sugar in them. Did you know that garlic salt has sugar. Really. I’ve learned to read food labels more closely. You’re eating real, unprocessed food for 30 days and there is no doubt you will feel better. My hair was healthy, skin was clear, nails were strong and I had energy. I never knew real food could taste so good. And can I just say that it feels so good to accomplish something like this? It isn’t easy and you can be proud of your success. Just as I said above, it isn’t easy. I found the biggest con to be the meal prep. If you want to eat healthy, you have to plan ahead, and that’s hard for me. I suggest doing a lot of prep work before you start your Whole30. Go shopping. Stock up. Make some Whole30 freezer meals. Another con to some is that the foods you are cutting out, such as dairy and whole wheat, contain nutrients that your body needs. And you’re right. If there is not a reason to cut out a food, you probably shouldn’t. The Whole30 program is not meant to be a long-term solution, but rather a 30 day challenge to help your body heal, then slowly introduce the eliminated foods back in so you can see how they affect your health. Oh…and the detox part of the Whole30 is definitely a con, but it is necessary. Your body will not like you stripping it of sugar. You’ll have headaches. You’ll be tired, but you’ll get over it and rebound quickly. You can find a complete list of Whole30 foods to pick up at the grocery store here. Specifically, I like to make sure I have lots of meat, fresh fruit and veggies, potatoes, spices, cashew milk, coconut oil, and avocado on hand. The important thing is that you go shopping before you start so you aren’t tempted to grab a bag of the chips that are hiding in your pantry when the hunger cravings come calling. Also, if you’re looking for an easy way to find great deals on healthy foods, give Thrive Market a try. They cut out the middleman to give you the best prices on natural products and healthy foods. Get 25% off and free shipping right here! What should I expect when I do the Whole30 Challenge? You can read through our experiences here. Also, the Whole30 has a calendar of what you can expect to feel each day. It’s so accurate, although we’ve found that the more Whole30 challenges we do, the faster we move through the calendar. Yes! You can read our second Whole30 results here. I’ll be honest. We’ve not been the best with this. When our 30 days are up, we’re ready for a chocolate chip cookie and generally dive right in. We know that dairy can affect my husband negatively and I don’t do so well with corn, but other than that, we’ve not done an official reintroduction. Since this is a more involved process, I’ll let you read all about it here. Of course! We took some of our favorite comforting family dishes and tweaked them just a bit to be more Whole30 friendly. Some may have ingredients that you feel you need to stay away from (such as potatoes), but these are now our most-loved breakfasts, dinners and side dishes.